Mary Kyne's apron . Made in school 1958. 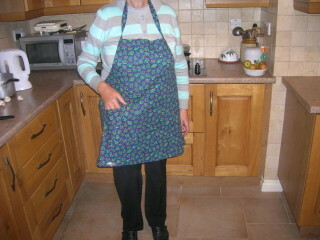 Una O Halloran - apron designer extraordinaire! 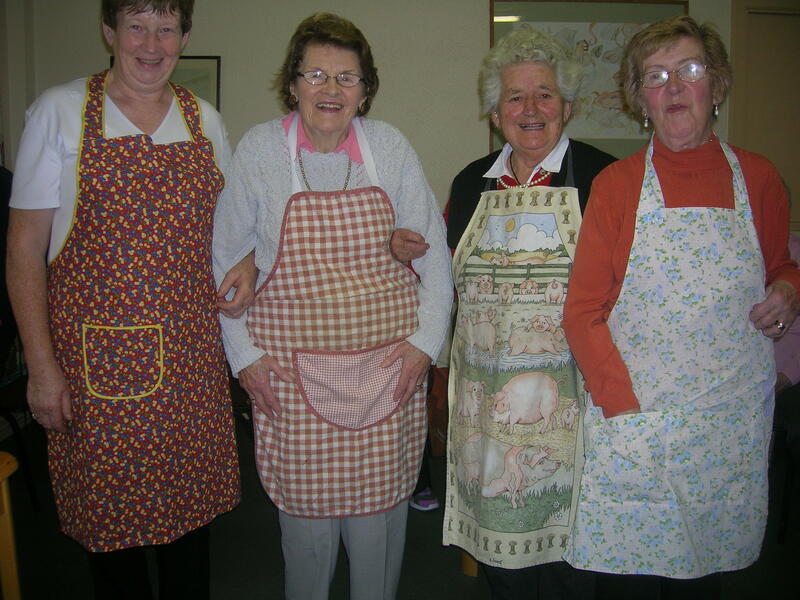 Oughterard Senior group who meet every Thursday have a wealth of memories of days gone by. 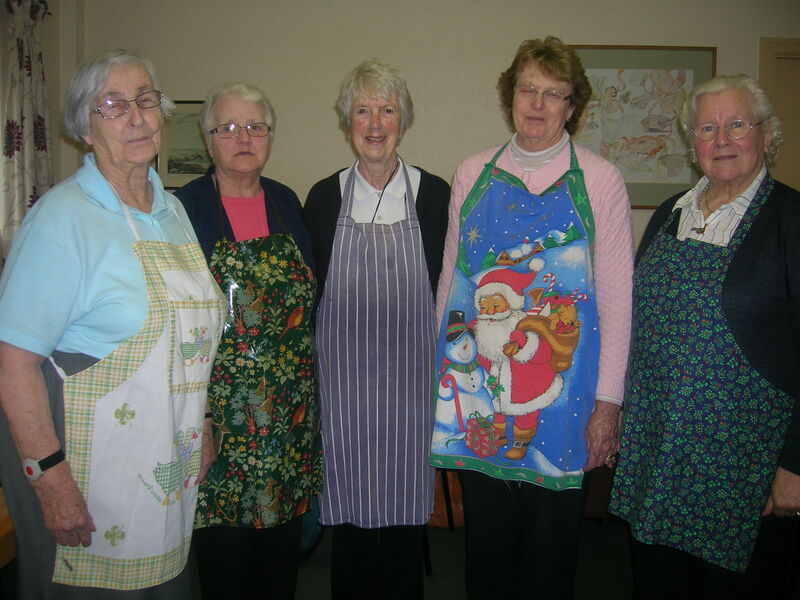 The topic of ‘Aprons’ arose at our last get-together. Who wore them? Why were they used? Why were they abandoned in the 60’s? It was generally held that aprons came about out of practical necessity. In years gone by there were no washing machines. Clothes were washed in a large bath or tub with the aid of a washing board, carbolic soap or Sunlight soap that was melted in hot water before adding to the tub. Washing and drying clothes was not done on a frequent basis so the apron was a great substitute to cover up the good clothes. It was easier to wash aprons than dresses as they used less material. 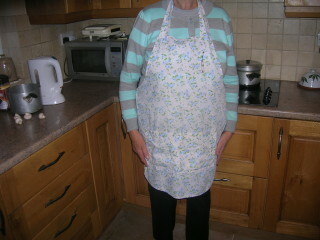 People didn’t have the luxury of owning a large wardrobe so it was necessary to look after ones clothes hence the apron. There were different styles of aprons. Some were simple squares or rectangles of linen-cloth tied around the worker’s waist. Half aprons of highly starched cotton were common in the 50’s. The first garment we made in sewing class was an apron as the basic stitches of tacking, running, hemming, top-sewing and back-stitch were used. We often embroidered the pockets. We used bright coloured material – the brighter the better. We used coloured bias-binding of contrasting colours. We learned in the laundry class how to starch the white aprons. Una O’ Halloran makes an apron every year for May Canavan. She made one with a navy background with patterns of sprigs of holly with red berries. May didn’t just wear it for the festive season but wore it all year round. 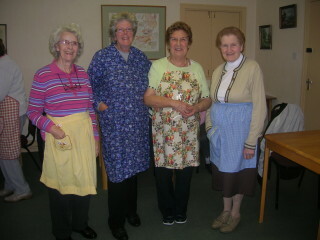 Full aprons or ‘pinnies’ were worn as fabric became more available. More cutting and fitting of the garment was done. Pinafores had two holes for the arms and were tied or buttoned in the back. A delightful photograph of Oughterard school children (Kathleen Joyce Madden, Mary Joyce and Chris Kenny) with hands joined, wearing pinafores strolling down Main Street after school appeared on the cover of the Heritage Feilire 2008. Bridie Lydon remembers aprons that followed the silhouette of the dress. They were very long with no waistline and tied at the back. Lily Clogerty’s mother wore such an apron when swimming in Salthill. Aprons had pockets and were tied at the back by two ribbon like strips of cloth. A bib apron had a strap around the neck or shoulder straps that criss-crossed at the back and were attached to the waistband. The late Mary Lydon of Glengowla told me that a favourite pass time of her grandchild Adrian was opening her apron strings. A flight path from Shannon Airport went over my Grandad’s farmyard in Tuam. When Grandma saw the planes she pointed skywards “There goes the plane to Pappy and Chrissie (her son and daughter) in New York. If we hold out our aprons the pilot will drop sweets from New York,’ she said. And so it came to pass. One day on hearing the noise of an approaching plane we rushed out into the farmyard, closed out eyes tightly, opened out our aprons and listened as it thundered overhead. Low and behold when I opened my eyes my apron was full of CREAM CRACKERS!!! Una has several aprons. 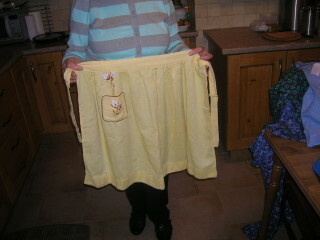 She made most of her aprons. The blue ging-ham apron was made from waste material for the Art’s Festival. The pale blue and white apron was made from material left over after a dress she made for Nora Molloy, Camp St., who came to live at the Boat House many years ago. The apron is thirty years old and you can’t wear it out. Una wears it when cooking. 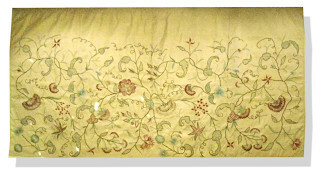 The material for the navy apron with sprigs of holly came from Chicago many years ago. Una makes aprons as Christmas presents from this seasonal material. 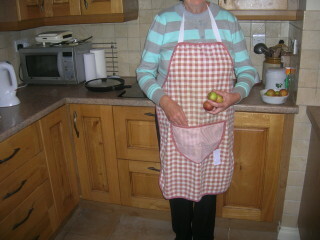 Una bought the brown and cream apron with a large front pocket as a souvenir of her visit to Bellmullett , Co. Mayo. 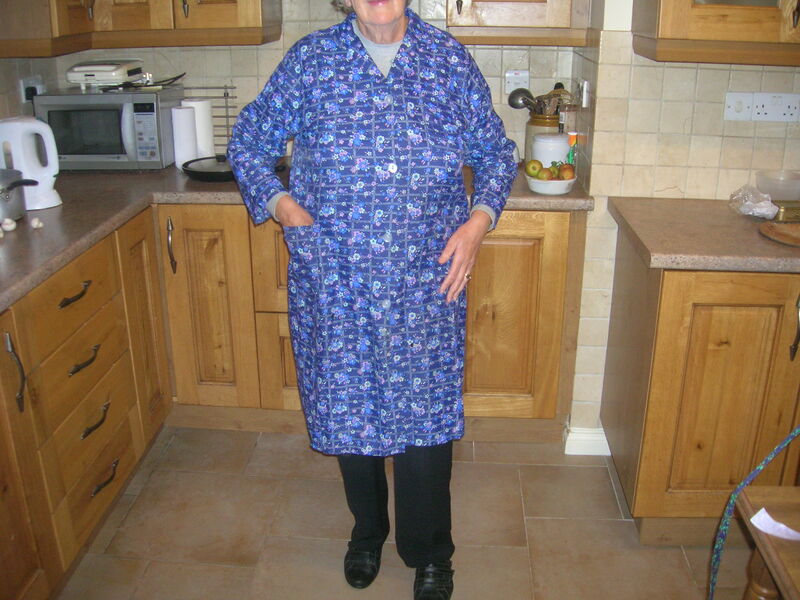 Una’s favourite apron is the blue patterned coat apron belonging to her mother Margaret (Mag) Faherty, Moycullen. She wore it every day. 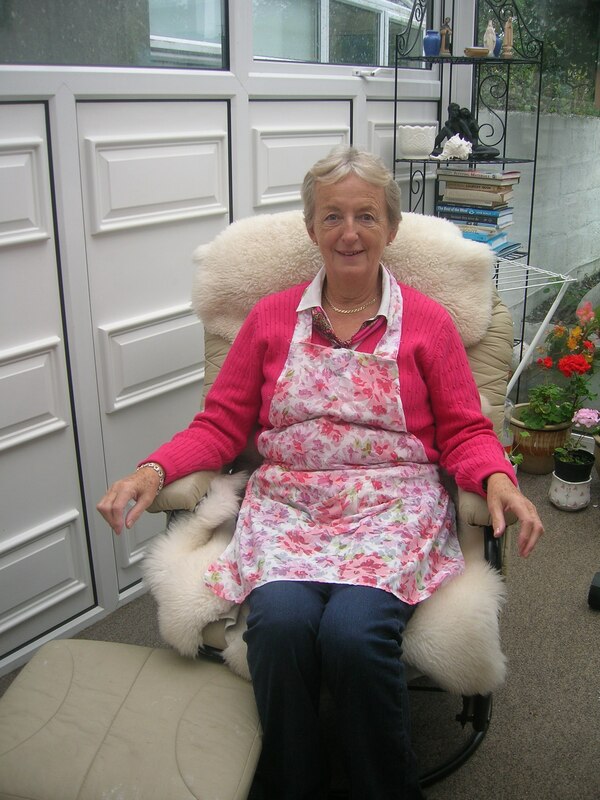 Her friend Annie Burke came every day to visit her at 4 o’clock for a cup of tea and scones. The table was set with two china cups, matching saucers and plates – no mugs for those ladies . They knew how to drink afternoon tea in style. They would smoke two cigarettes with their tea as they exchanged the news of the day. On one such occasion Mag burnt a hole in the sleeve of the apron with a cigarette. This apron is 40years old. If aprons could talk they would have many a tale to tell! The kitchen apron was a common fixture in homes during our life times 30’s, 40’s and 50’s. The perceived good mother and homemaker was rarely seen without an apron. 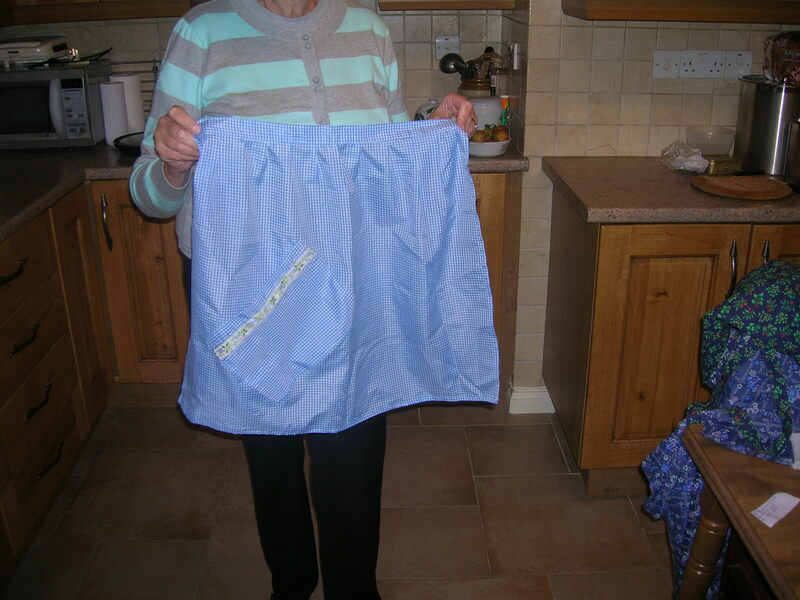 In fact Nuala Walsh, now in her 80’s is the proud owner of no less than 10 aprons. There are many kitchens to day that are apron-less. In the 60’s when the feminist era dawned, aprons were largely abandoned along with bras!! The modern housewife all ‘glamoured’ up wearing her apron was no longer prepared to wait patiently for her husband to return home after a hard day’s work! The servile attitude was gone! 1. Pot-holders. Lily Clogerty remembers that her aunt wore a canvas apron and used it to lift huge boiling pots from the crane over the open fire. The apron was made of feed cloth, a heavy fabric that the intense heat could not penetrate. My own mother used the same apron when cutting potato slits in spring while my math’s teacher Sr. Pascal wore it while working in the school glasshouse. 2. Collecting eggs from the nests, fallen apples, pears and plums from the orchard. 3. Women carried hot baked bread, treacle bread, and mouth-watering apple pies from the oven to the window sill. 4. Betty Gibbons carried clothes pegs for hanging out the washing in her pocket. 5. The key to the cupboard was carried in the apron pocket. 6. Dorrie Faherty remembers the Christmas shopping was wrapped in a large apron and carried home from town. 7. Mama’s big apron wiped away tears, cleaned childrens’ dripping noses and cleaned out dirty ears. 8. The coat apron was a great cover up when breast feeding. 9. Women carried a string of safety pins pinned to the apron. They were at the ready for the baby’s nappy and for a myriad of other uses. 10. When visitors arrived shy kids found refuge from prying eyes under the cover of the apron. 11. When the weather was cold wrap around aprons provided an extra layer of clothing for warmth. 12. The apron carried in vegetables, kindling wood or ‘cipíní’, from the garden. When the apples were peeled it carried out the peelings for the animals. After peas had been shelled, it carried out the hulls. 13. Sods of turf were carried from the reek of turf by the gable end of the house. 14. Barbara Mc Sharry remembers her mother carrying slits in the apron for sowing. 15. Kathleen Walsh carried her ‘fags’ and canderelle in her pocket while others carried their rosary beads. 16. Nuala Walsh maintains that the bib apron caught ‘dribbles’ and stray grains of snuff. 17. 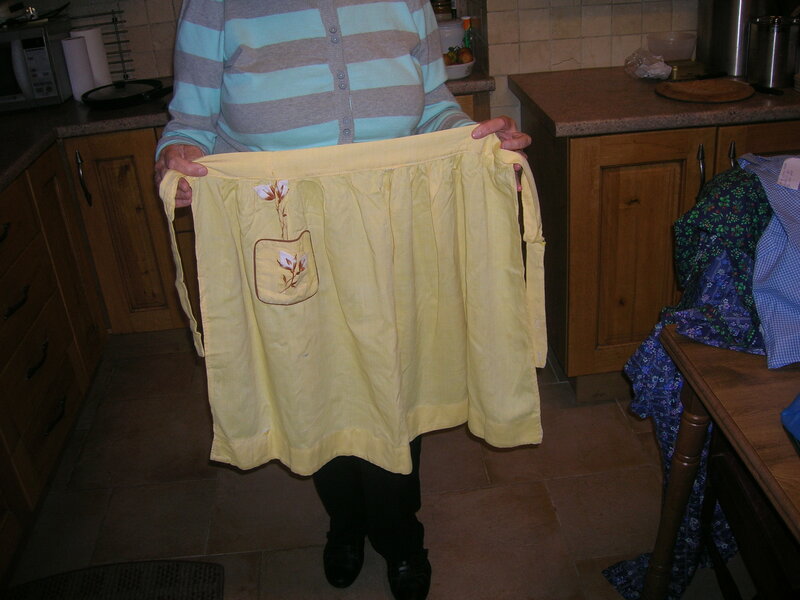 Lily Clogerty remembers the apron being hurriedly removed when unexpected visitors were spied coming up the road. It acted as a duster and in a matter of seconds the mantle piece and furniture was spick-and-span. 18. 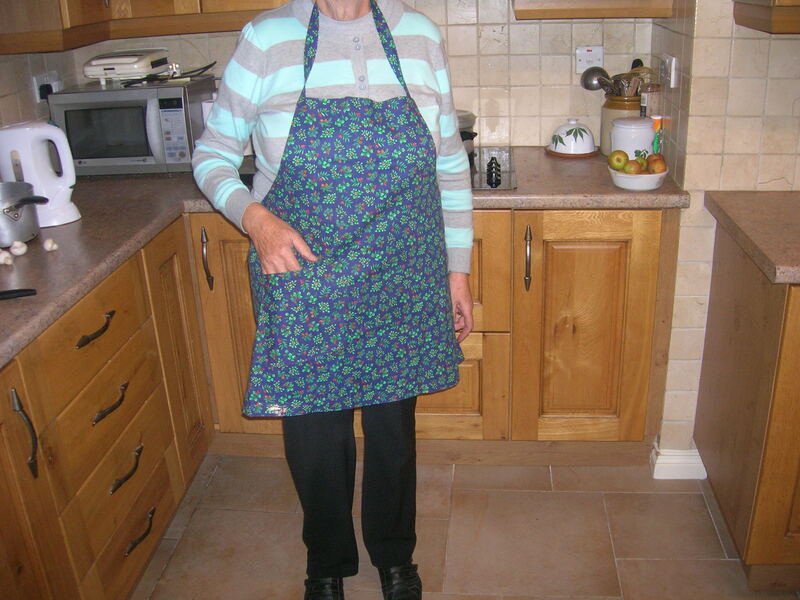 When dinner was ready Grandma waved the apron – a signal to the workmen that the dinner was ready. It was a time to down tools and come into dinner. Farmers put aprons on scarecrows. 19. Big aprons wiped many a perspiring brow when hay making or when the housewife was bent over the open fire cooking. 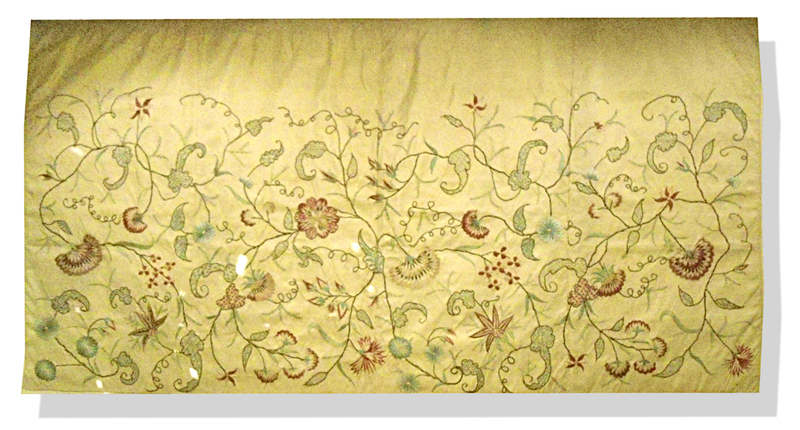 Aprons were used as a cover up for tasks that were messy – craftspeople dealing with sharp implements or hot objects to protect them from the dangers of their crafts. Occupations such as butchers, welders. blacksmiths and bakers used aprons to keep their clothing clean. Cobblers wore leather aprons. Butchers wore navy-blue and white striped aprons. 20. Hairdressers used an apron to protect clothing from hair colour stains and hair clippings while at the same time serving as a place to keep tools quickly accessible. 21. 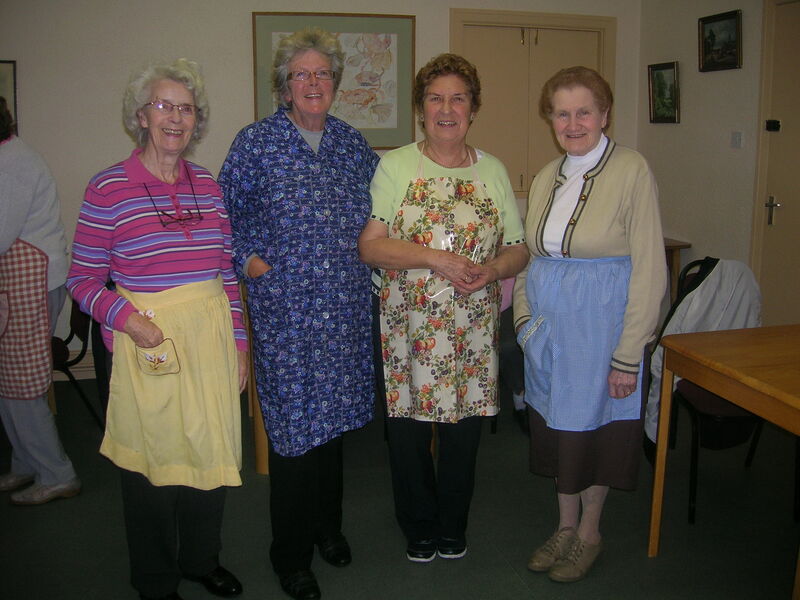 Household servants from cooks to maids wore aprons. They were often a symbol of their status. Yes in deed the old fashioned apron served many purposes. Hold on to your aprons ladies. Perhaps the tide will turn and they will once again become fashionable! Great memories and stories about aprons. Thank you for sharing. Were they ever called ‘bibs’? Or is this only the full wrap around apron?